When you think of ‘the past,’ you might think back to a few decades ago, or when your great-great-great-parents were going about their daily business. However, history is so much more than that. The world has been around for much longer than we may realize, and some of our daily routines and practices can actually be traced back thousands of years. Of course, there are so many different eras to explore, but Ancient Egypt is perhaps one of the most remarkable and the most intriguing. While these ancient people may have roamed this planet around 5,000 years ago, we still have only just started to piece together how this colossal civilization lived their lives. Their kingdoms lasted for over 2,000 years, so how do we still know so little? 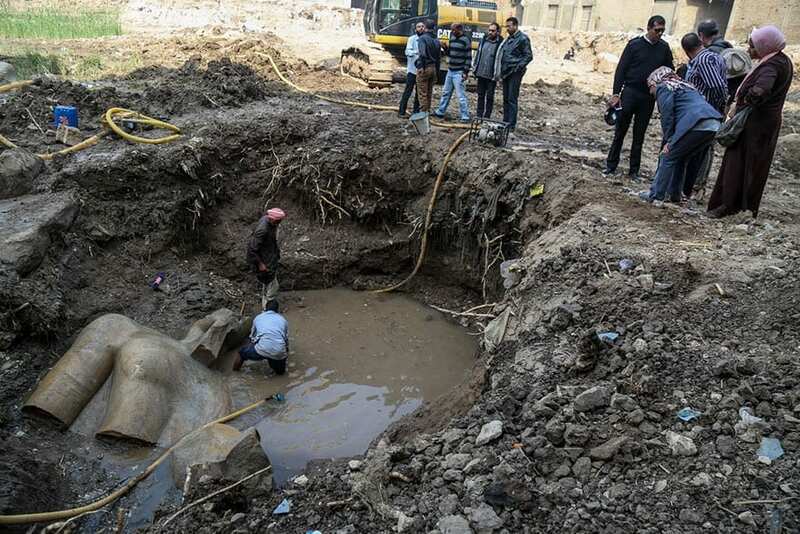 Well, this discovery of a 3,000-year-old statue in Cairo could be one of the most important discoveries of all time. It’s believed that those in Ancient Egypt first made their mark on the world around 5,000 years ago, and although these Pharaohs reigned over their people for more than 2,000 years, very little is known about them. Over the years, historical experts and archeologists alike have dedicated their lives to understanding their practices, their religions, their construction techniques, their languages, and their way of life, and we have been able to piece together rather large pieces of the puzzle. However, there are still gaps in our knowledge, and these people are now trying to scour the country of Egypt to find these missing pieces. Many of these pieces have been found over the years, but perhaps one of the most impressive links in the chain was found in 2017. After running numerous tests and analyzing this statue found within the slums of Cairo, we now know even more about this ancient civilization. There are countless professionals, hobbyists, and teams of people across the world who make it their mission to understand more about Ancient Egypt. In fact, we have one particular team to thank for this impressive discovery. The Heliopolis Project was founded in 2012 and is hailed as a joint collaboration using Egyptian and German minds. 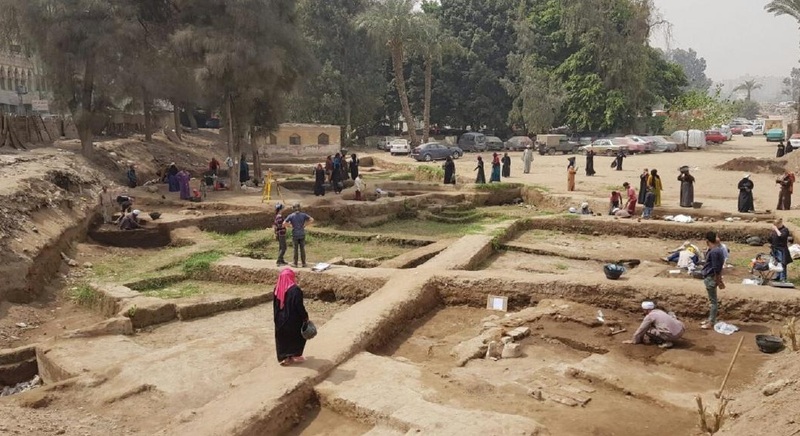 Headed up by PD Dr. Dietrich Raue, who teaches at the University of Leipzig, and Dr. Aiman Ashmawy, who works at the Egyptian Ministry of Antiquities, these professionals decided to form a team and excavated the ancient archeological site of Heliopolis. 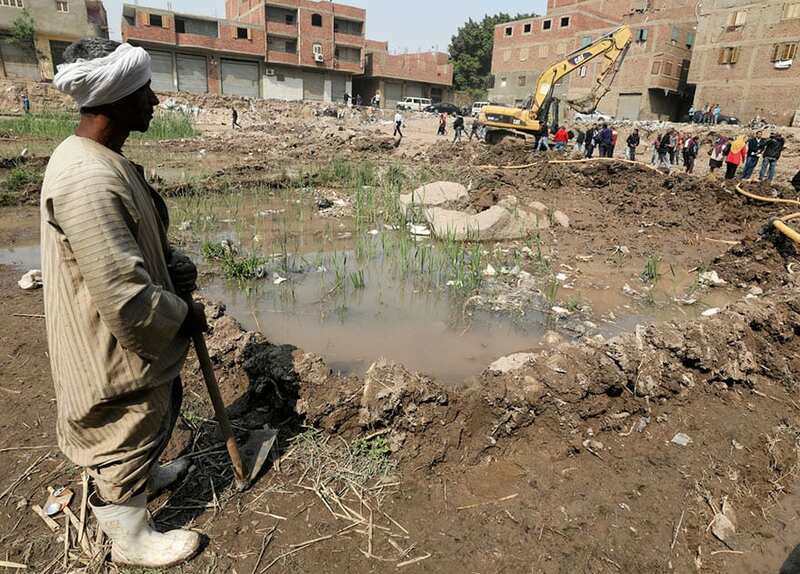 They split this area up into nine smaller segments, which lie beneath the surface of a Cairo slum in Matariya. Thanks to this project, we were able to set our eyes on this incredible statue that tells us so much about the people who built it. 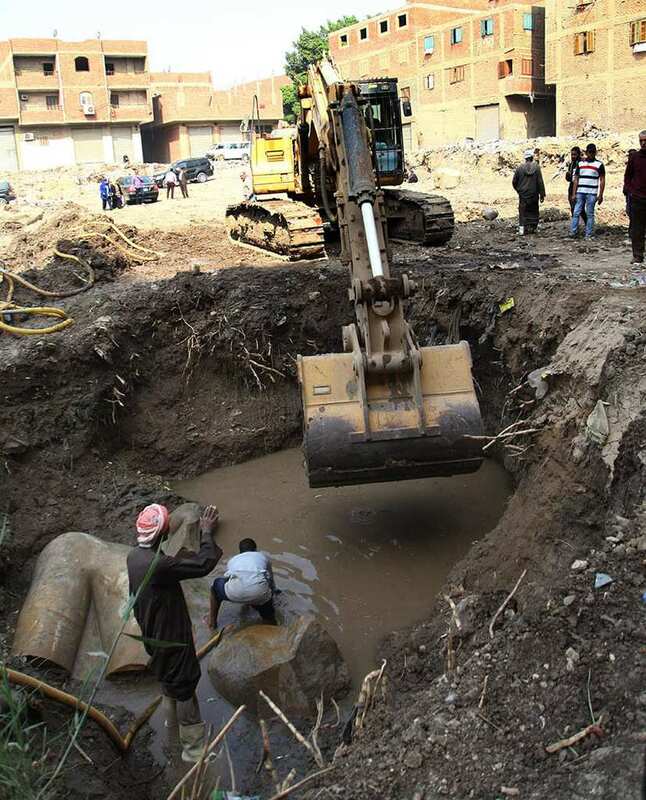 What’s so remarkable about the Heliopolis Project is that it was largely spurred on by a hunch. 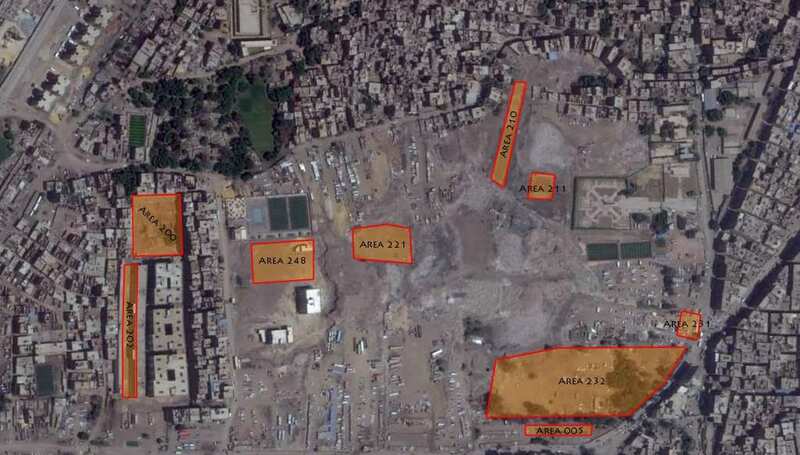 The areas underneath the slums in Matariya had actually already been investigated and excavated in the past. Former teams had scoured the area for hidden clues of a past civilization, and although they found various artifacts and hints towards history, they didn’t find anything of note. 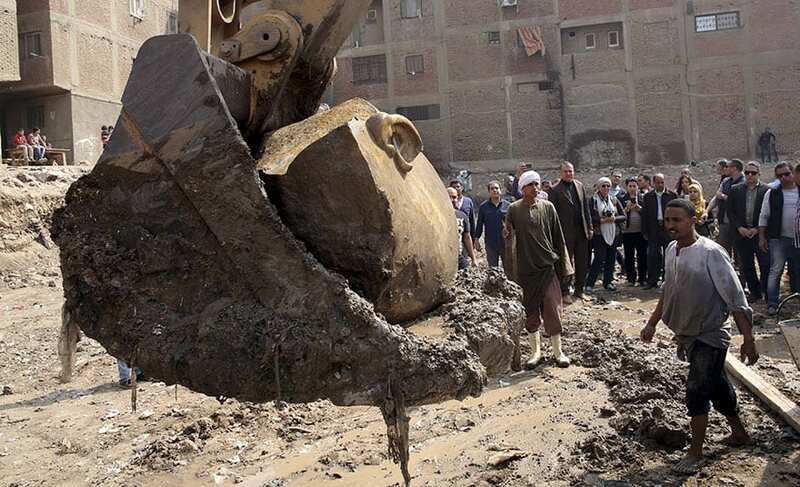 However, the team behind the Heliopolis Project had a feeling that these teams had missed something. They wanted to give it another go, and they wanted to really go through the areas with a fine-tooth comb. They weren’t going to give up, and their persistence paid off. After five years of intense searching, the archaeologists eventually stumbled upon something that would go down in history itself. 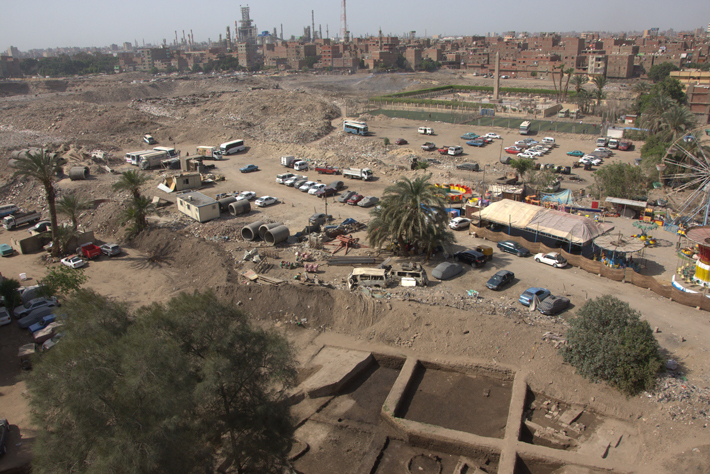 The professionals had a gut feeling about the area in what used to be Heliopolis because this ancient city was the center of Ancient Egyptian civilizations. According to old Egyptian stories, those who lived thousands of years ago believed that the world was created from a center point within this city. With direct routes to the sun, Heliopolis soon became a place for Sun worship. A famous temple was built on the sacred ground, and Ancient Egyptians made their way to the temple as a form of pilgrimage to worship the sun gods and pray to Ra. In fact, it’s even believed that this temple was home to a large and prosperous priesthood who would surround their lives around the giant ball in the sky. The importance of the temple and Heliopolis as a whole meant that many pharaohs also opted to be buried nearby. With this in mind, the archeologists hoped that they would find some links to these ancient pharaohs within their excavation sites. They utilized modern resources and their knowledge of this civilization to scope out areas of note, and it was in one particular area that they found basalt bases. From what we know of Ancient Egypt, workers would use this basalt rock to serve as the base for a large statue. This was an impressive find and led the archeologists to believe that there must have been its respective statue nearby. They continued searching, which is when they stumbled across a giant pit in the ground. It was full of water and dirt, and they initially assumed it to be empty. On closer inspection, however, they soon discovered that it wasn’t. 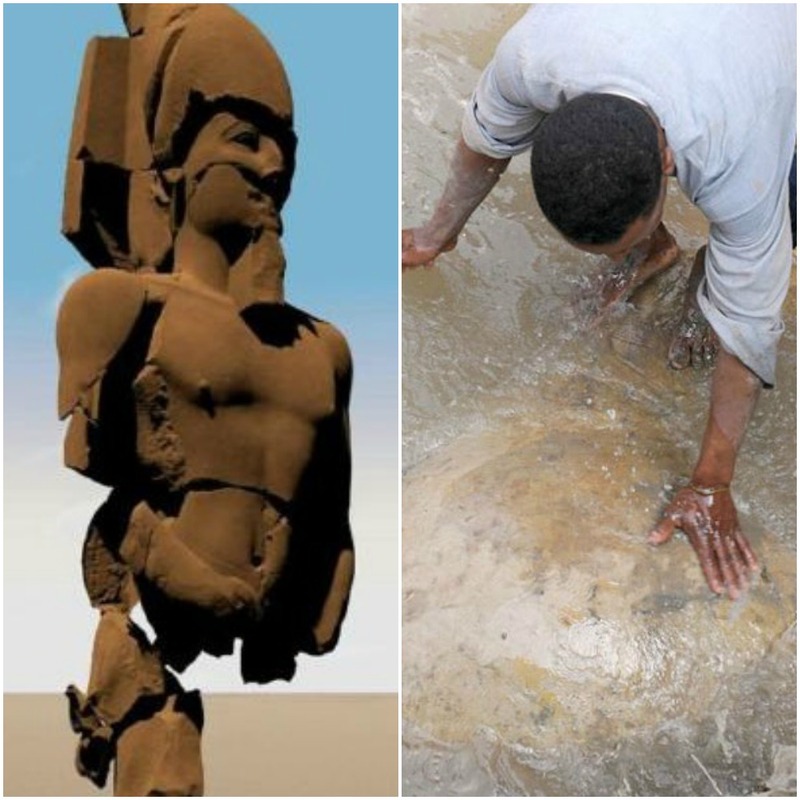 As the experts removed some of the water and dug beneath the surface, they were amazed to find remnants of a colossal statue. Made from quartzite, the initial statue they found was the head of what looked like a pharaoh and was eight meters long. 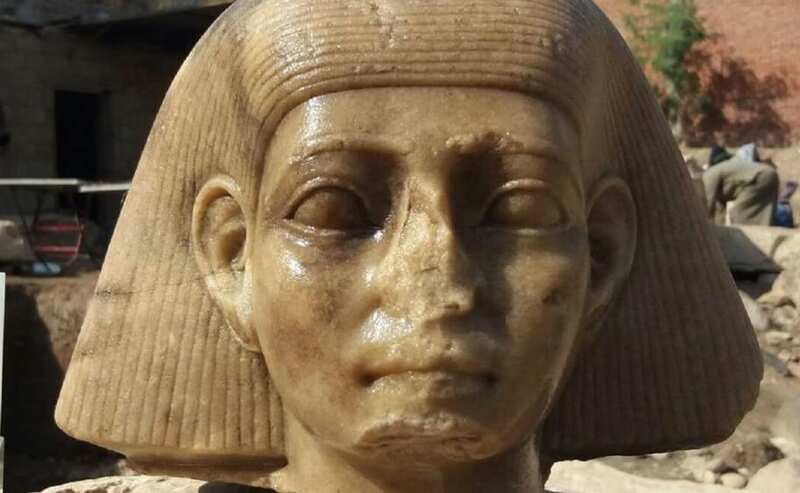 From first glance and their knowledge of the area and the appearance of the head, they came to the conclusion that this head was actually a depiction of Pharaoh Ramses II, who lived around 3,000 years ago. However, after a year of investigation, they soon realized this was incorrect. 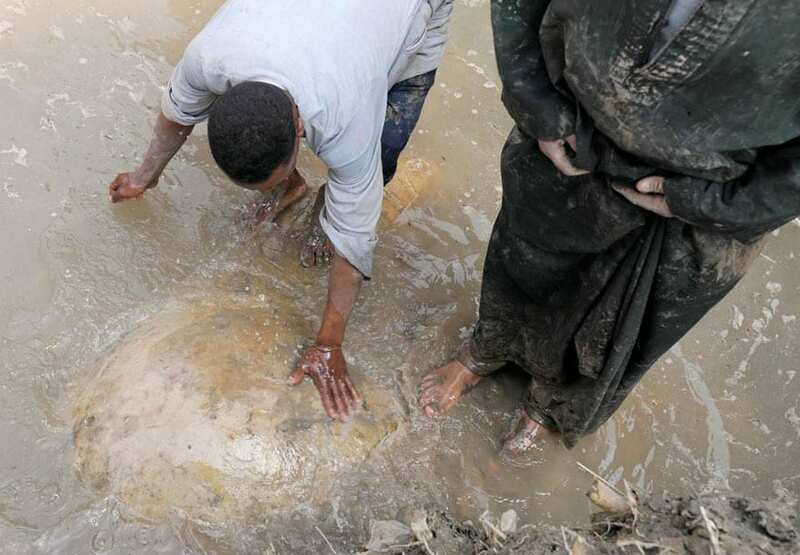 Amazingly, this wasn’t all that the team found underneath the surface of the ancient Heliopolis site. 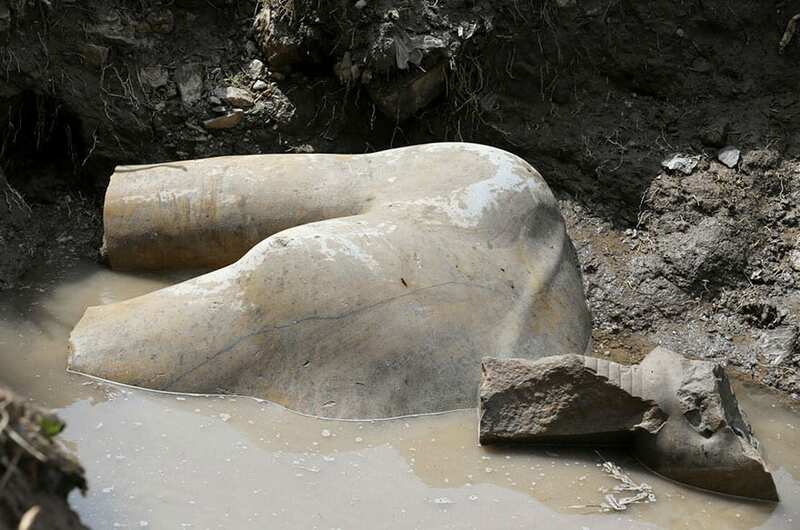 The archeologists also dug up a huge torso section of the statue, although the legs and hips were missing. 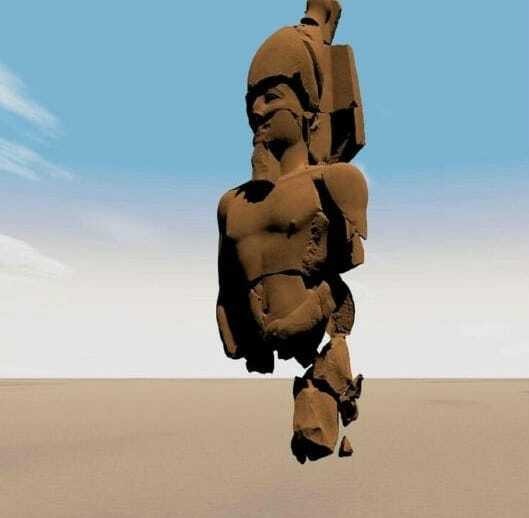 The experts believe that the bottom half of the statue also lie beneath the ground somewhere, but acknowledge that it could be almost impossible to find them, considering the area is known built up with a modern civilization. 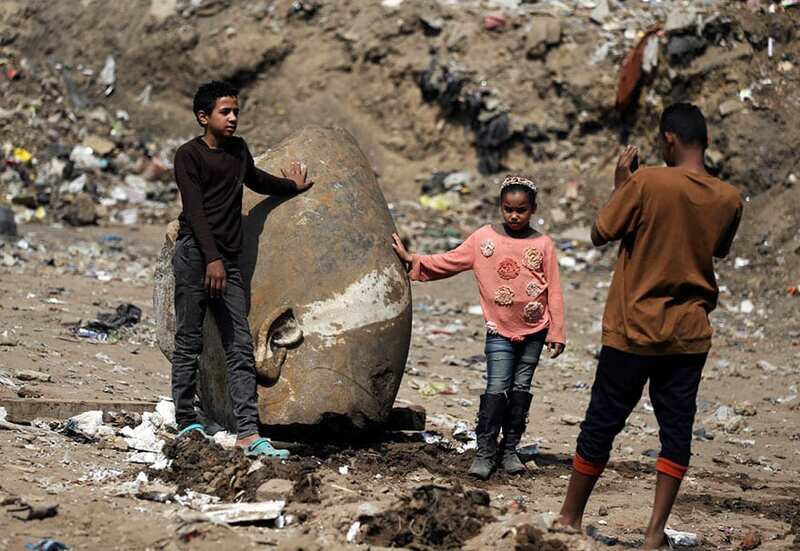 As if that wasn’t enough, an obelisk and a partial statue of Ramses II’s grandson, Pharaoh Seti II, was also found at the site. When the archeologists stumbled upon the items, they were still partially buried beneath the ground. Because of this, they knew that they would have to get down to the statue’s level and get a better look. They also knew that they would have to lift it out from the ground, and they ultimately used a digger to do this. This use of modern machinery caused outrage with the locals and other experts, but those in charge noted that there was no other way. 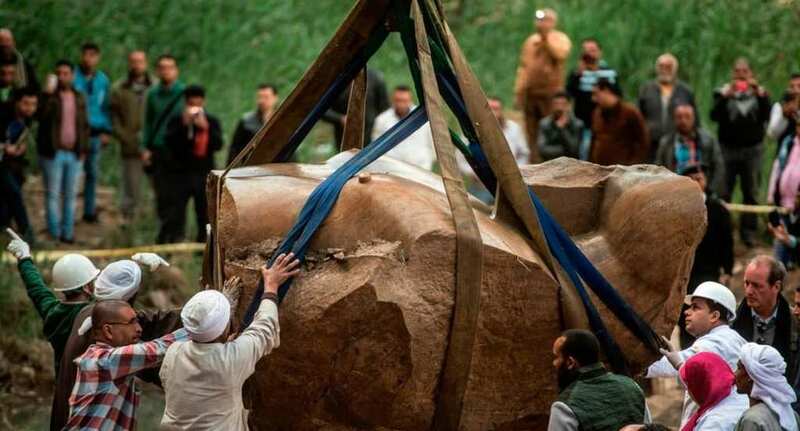 The head of the statue was extremely heavy, and no other machinery would suffice. 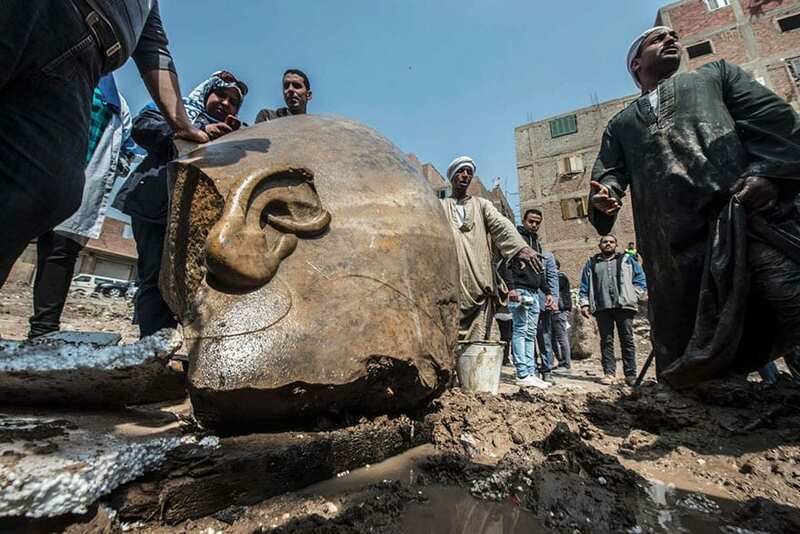 As those around the dig site really got to have a look at the head of the statue, they were almost convinced that they had unearthed a stone figure of Pharaoh Ramses II. As one of the most famous pharaohs in Ancient Egypt, this man had a remarkable impact on the ancient civilization. In fact, he was so well-loved by the people of Heliopolis that they decided to build a temple in his honor. Considering the statue was found just a stone’s throw away from this temple, the archeologists were able to put two and two together. Ramses II was a man of many names, and he was often known as the “Keeper of Harmony and Balance, Strong in Right, Elect of Ra.” He was considered to be one of the closest people to the sun gods, and he was renowned as a military leader. Because he lived to be 96 years old, Ramses II had the time and the power to truly make an impact on the world around him. His life and reign have been depicted in stories and scripture over the years, and statues have been found across Egypt. However, many of these had been badly damaged. These artifacts have been damaged over the years due to the fact that they are incredibly old, but also because they were broken during the Greco-Roman era. As this new era dawned on the world, the new civilization tried to eradicate remnants of the past, which is why very few statues of Ramses II remain. Because of this, the experts believed that they had found an extremely significant discovery. They believed they had found a pristine statue of the pharaoh, but further tests showed them that they were incorrect. 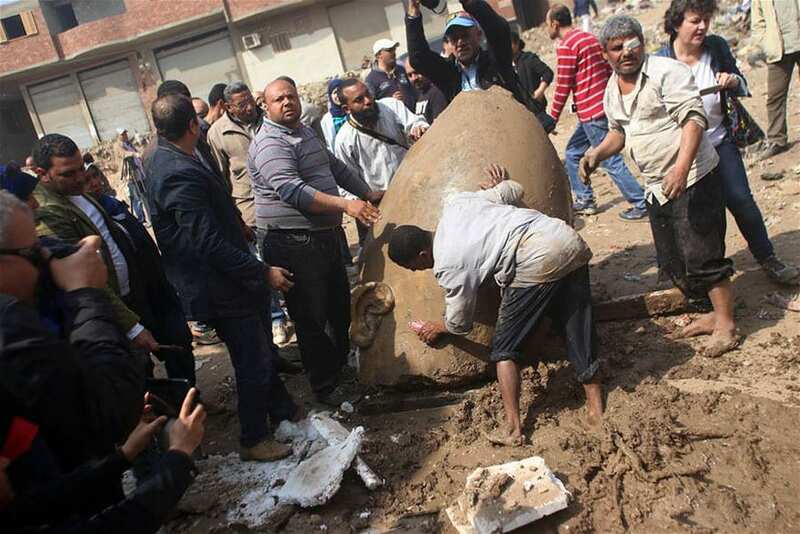 When the experts found the pieces of the statue, they took them away to be researched and investigated further. With new technology and machinery to test these historical items, we can now learn even more than we once could. 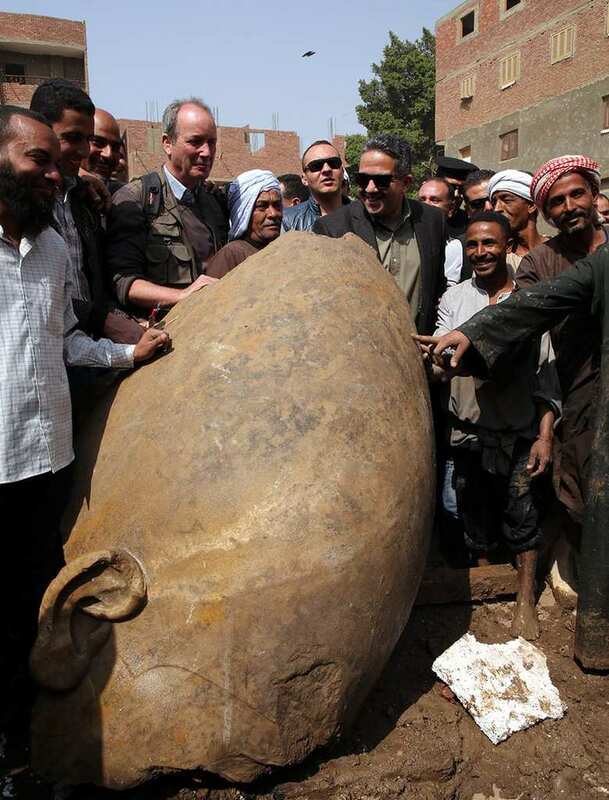 It was during this in-depth investigation that the archeologists realized that they hadn’t found a statue of Ramses II at all. They had found the statue of another lesser-known pharaoh, and many on the team were extremely disappointed by the news. However, they soon realized this discovery was even more impressive than the first. As they took a closer look at the statue, those on the team actually find a tiny inscription that was hidden on first inspection. 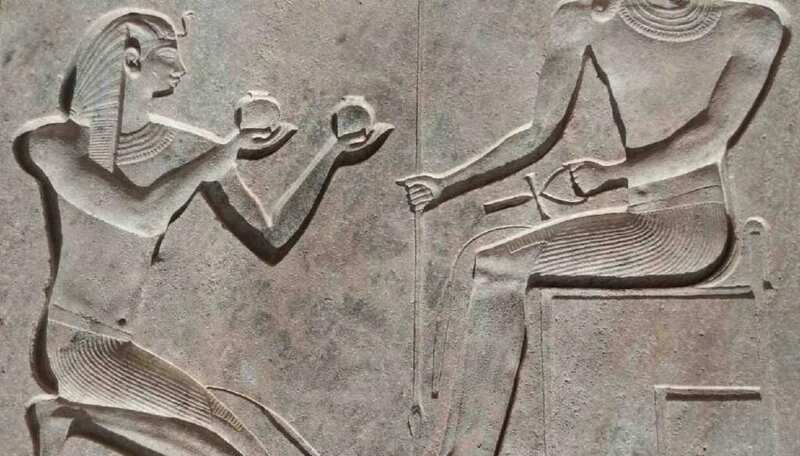 As they translated the ancient language and read what the inscription said, they noticed that the words hinted towards a pharaoh by the name of Psamtik I. As a fairly unknown pharaoh, the experts knew that the had actually ruled much later than Ramses II. In fact, he ruled over Egypt a whopping six centuries after the famous pharaoh and is known to have reigned from 664 – 610 BCE. 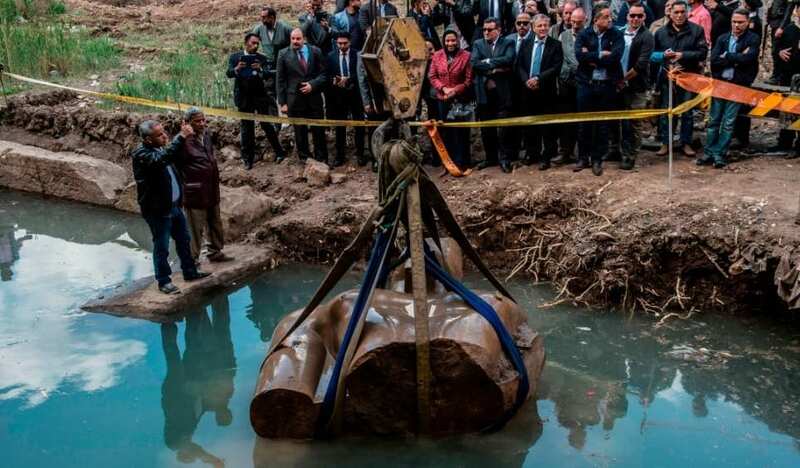 Although many people on the team were disappointed to learn that they hadn’t found evidence of Ramses II in the statue, the leaders of the Heliopolis project were over the moon. In their eyes, this was a much more rare and exciting find than one of a pharaoh they already knew a huge amount about. 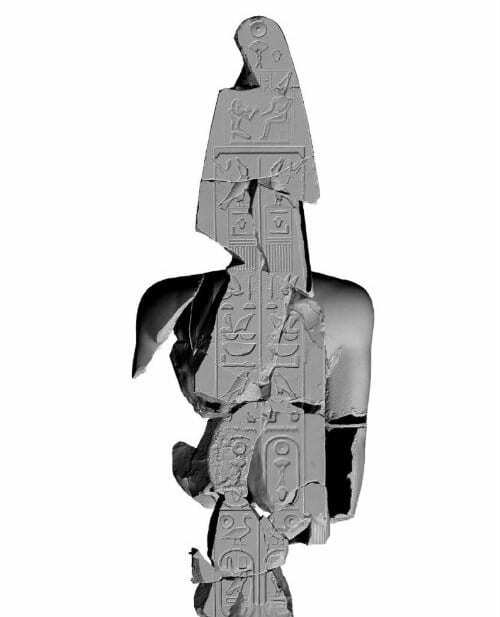 By finding this statue of Psamtik I and piecing together the pieces to form a 3D image, they were able to get one of the first real visuals of a pharaoh who had previously slipped under the radar. As they investigated the 3D image and poured over the new visual that was in front of them, the team were able to confirm that they had indeed found a statue of Psamtik I. They were able to see exactly what he and the statue would have looked like in full form, and they even noted that the statue itself would have stood at an incredible 26 ft tall. This was an impressive feat, but there was something else about this statue that caught their attention. What struck the experts about the statue was that the pharaoh was not simply sitting down or standing up with his arms to his sides. Instead of being pushed against his body, Psamtik I was reaching out his left arm and holding it out in front of his body. The experts were quick to note that this action referred to sun worship. 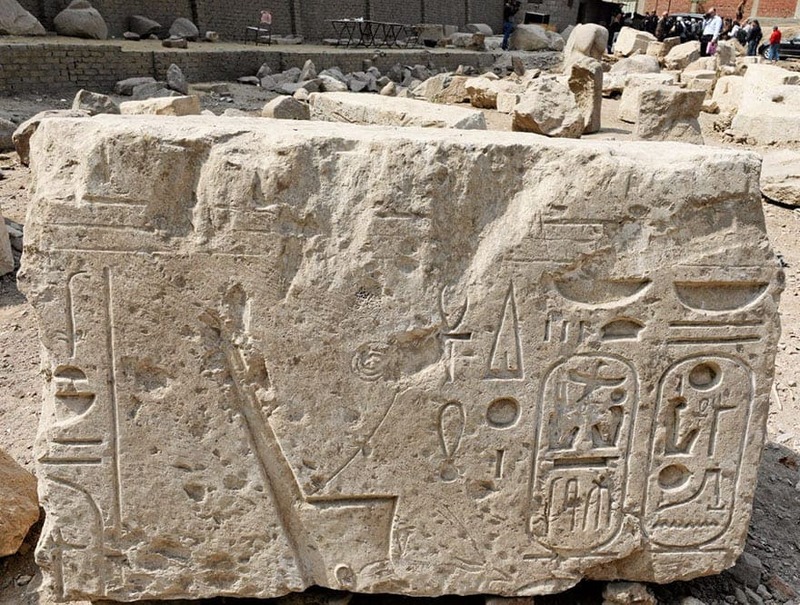 Like many of the other pharaohs before him, Psamtik obviously believed that Heliopolis was the center of the earth, and the true path to the sun and the sun gods that reigned over it. Was he reaching out to the sun? As if the 3D image of the statue wasn’t enough to confirm that they had stumbled upon a remnant of Psamtik I’s reign, a carving was also found on the back of one of the pillars. This carving shows a figure, which they are convinced is Psamtik I, kneeling down and offering gifts to the god Atum. Known as “the complete one,” it’s believed that Atum finished the creation of the world and that everything within the world was born from his flesh. Once again, this showcases the fact that those who lived in the era of Psamtik I also followed these sun-worshipping doctrines. What makes this statue of Psamtik I so impressive is that, just like the modern world, the ancient world dealt in changing trends. While statues and colossal structures were built to honor pharaohs and leaders during the first few thousand years, most experts believed that the trend had started to diminish as the years went by. Because of this, they assumed that pharaohs who ruled during the era of Psamtik I did not utilize these statues. So, this statue is incredibly rare, and incredibly unique, and may even be one of the only ones in the world. From his findings, Dr. Raue actually believes that Psamtik I sparked a cultural revolution in Ancient Egypt. Under his rule, art, religions, and culture took on the ideals of historical pharaohs and brought back the likes of statues and pyramids. It’s even thought that Psamtik wanted to associate himself with Ramses II. 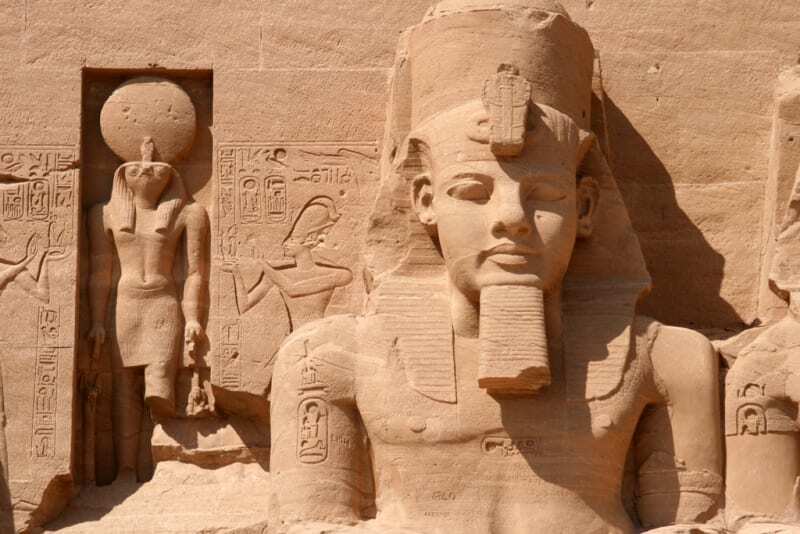 As one of the greatest rulers of all time, Psamtik I may have looked up to the man who had once dominated his kingdom, which is why he wanted his statue to be placed near to Ramses II’s famous temple. Although it seems as though Psamtik I did make an impact during his reign, the experts also believe that he may have got on the wrong side of somebody over the course of his lifetime. During their investigations, they found tell-tale signs of damage that link towards the Greco-Roman takeover. However, they have also found other forms of damage, especially around the mouth, that cannot be associated with this time. Because of this, they have come to the conclusion that somebody deliberately tried to damage the statue. The experts hope to dig even further into the ground and excavate the areas surrounding the initial dig site, but they are not sure what they will find. Although the area is now a large slum area and not covered in large buildings, it will be a mammoth task to undertake nonetheless. So, for now, the Heliopolis Project and all of those who worked on this excavation can rest easy knowing that they have uncovered something extraordinary. After all, it’s not every day you uncover a 3,000-year-old statue depicting a relatively unknown pharaoh. 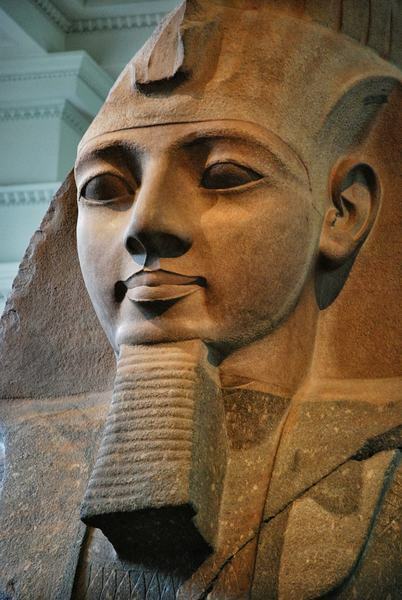 Moving forward, we can only assume that experts will try to uncover even more about Pharaoh Psamtik I and his reign. While we only know a small amount of information so far, there’s no doubt about the fact that this discovery will play a huge part in the subsequent investigations. Because of this, all of those involved in the Heliopolis Project should be incredibly proud of themselves. Thanks to them, we know more than we ever have before. Hopefully, we’ll learn even more in the future.